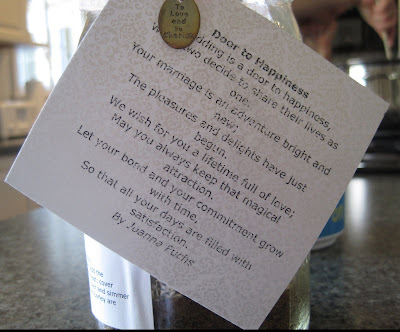 Back in April, a friend of mine made favors for my surprise bridal shower. 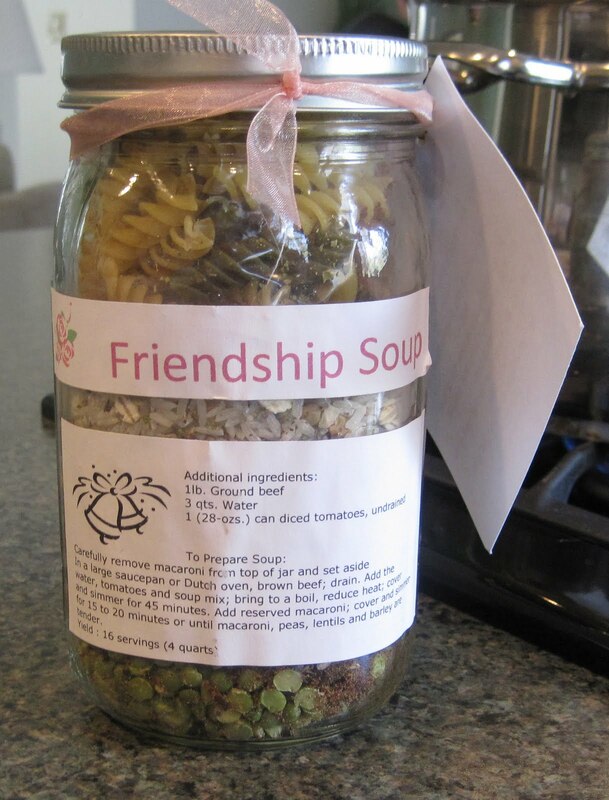 She & her daughter made jars of Friendship Soup. They even tied peach ribbon around the lid and attached a poem 'Door to Happiness.' Thanks to rearranging the kitchen/pantry this past July, SP & I had nearly forgotten about our jar of Friendship Soup. It was hidden in the back of a cabinet. We pulled it out this past week and decided to make it. I don't have any photos of 'Making the Soup.' All the ingredients are pre-measured and in the jar. We cooked a pound of ground turkey (not beef), added the tomatoes and water, dumped in the jar of stuff, and let it simmer away for 45 minutes. 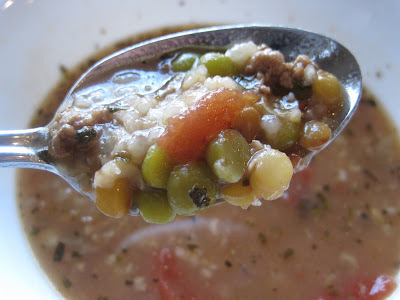 There's lots of stuff in this soup: the ground meat, tomatoes, split peas, lentils, rice, barley, pasta. 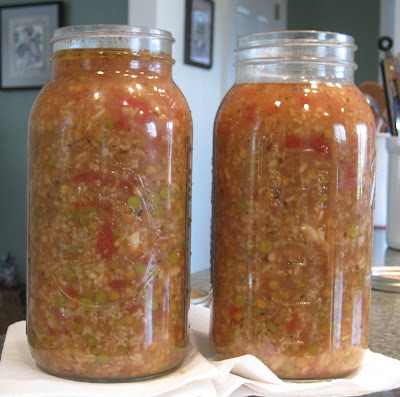 And this one jar made a lot of soup! Two huge jars! We ended up freezing one jar of soup. It's very tasty and filling. Sometimes we take things, and people, for granted. Making this soup made me remember what wonderful, thoughtful, caring friends I have and how very lucky I am. In a 1 1/2 pint jar, layer the first eight ingredients in order listed. Seal tightly. Yields 1 batch. 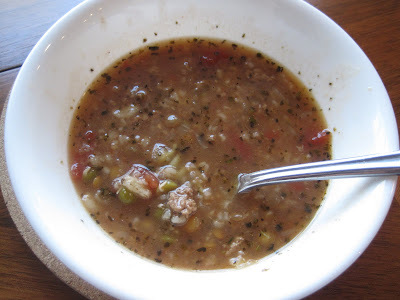 To prepare soup, carefully remove macaroni from the top and set aside.In a large saucepan, or Dutch oven, brown beef and drain. Add the water, tomatoes and soup mix. Bring to a boil. Reduce heat, cover and simmer for 45 minutes. Add the reserved macaroni, cover and simmer for 15 to 20 minutes or until macaroni, peas, lentils and barley are tender.Yields 4 quarts.